Tangled and True: matchbox valentines. Lily's Valentine party is today. She has been so excited. We found her the cutest vintage valentine's that lace-up. She loved lacing them and signing her name, but Stella was feeling a little left out of the Valentine fun. 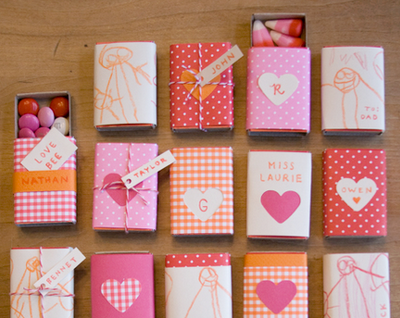 I saw these match box Valentine's on Design Moms blog and Stella and I went to town for her play group friends. I could make these all day. They are so easy, fun and adorable! thank you, thank you for this idea! can't wait to try it out with my girl. THIS is why I love to follow blogs! Thank you for the idea. I have been trying to come up with something fun for little Valentines and this is SOOO perfect. I love it. Aren't these matchboxes out of this world? So cute. I'm such a fan of little tiny creations.